Gardeners use a floating row cover for many different reasons. They can provide protection from frost and act as a sort of temporary greenhouse to protect plants. Others use row covers to keep pests off of plants, such as the voracious squash beetle that's almost impossible to control except through heavy pesticide use. While not inexpensive, they do last for years, so investing in one may be worth it for your home garden, depending on how frequently you plant to use it. Row covers consist of garden fabric, an opaque plastic fabric that is draped over plants. Many row cover kits come with hoops, sort of like big croquet wickets, that you pound into the ground to create a frame over which you drape the fabric. This keeps it from bending or breaking tender plants. There are many reasons to use row covers. They're used to extend the growing season or prevent frost damage, especially on vegetable plants. They can also be used as an organic pest control method, acting as a barrier to flying insects that damage crops. In some southern gardeners, they're also used to create shade during the scorching hot days of summer to protect tender seedlings. Most gardeners like to set their vegetable seedlings out as early in the season as possible to give them a head start and extend the growing season. 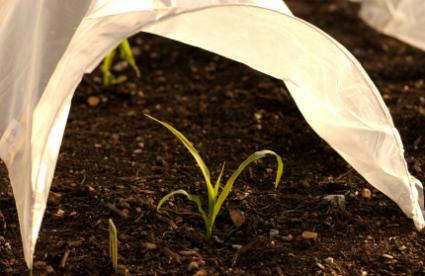 Row covers are used to protect the tender young plants from harsh spring winds or sudden cold snaps. By placing the row cover over the plants before the frost hits, you can keep frost from forming on the leaves and protect the plants. Row covers may be used this way in the early spring or in the autumn after setting out late season vegetables to extend the growing season. Some insect pests are difficult to control without harsh chemicals. Organic gardeners seeking other options may find that row covers protect plants adequately. Squash beetles, for example, fly among cucumber, squash and sometime melon plants and lay a cluster of bronze-colored eggs which hatch into hundreds of baby insects that can eat all the leaves off the plants in a day or two and kill the vegetable plant. The only organic gardening method that works is to use sticky tape to literally pull the eggs off the leaves, but this often damages the leaves. Even conventional pesticides may not work adequately or may need such frequent application that it's not worth growing squash! A row cover discourages the beetles, who may have difficulty gaining access to the plants hidden under the cover. The opaque fabric allows plenty of sunlight through to help the plants grow and thrive. If using fabric during the heaviest infestation periods, be sure to water frequently, since rainwater may not be able to penetrate the fabric. This technique works well for many types of flying insects but may also keep pollinators out too, and without pollinators you may not get vegetables. You'll have to weigh the pros and cons of this method over others. Vegetable gardens need full sunlight. In the deep south, however, full sunlight at noon on a July day may create ground temperatures over 100 degrees and literally scorch plant leaves. Some gardeners use shade cloth, a type of row cover that's tinted green or another color, to protect plants at midday during heat waves. Such covers cannot be kept on all the time but must be adjusted to protect plants during peak sun hours and removed to allow sunlight to reach the leaves the rest of the day. You can also use shade fabric to protect plants sown in the vegetable garden in late summer for the autumn harvest. Summerweight fabric is a row cover material that's lightweight and does not trap heat underneath. It's perfect to protect against insects. Shade netting offers protection against scorching sunlight. Quilted fabric offers a thicker row cover to create warmer temperatures. It's ideal for extending the growing season. Most fabric for floating row covers is sold in rolls or packages with the yardage on the outer package. Determine the square feet of your garden bed and add a little extra on to the final number to account for stretching the fabric over the hoops. You can use special staples to affix the fabric to the hoops or even clothespins. Burpee Seeds: Burpee calls them frost blankets, but it's the same thing. Order online through their website, by telephone or mail order. Johnny's Selected Seeds: Johnny's is another popular gardening catalog. They offer row covers, anchoring pins and more at reasonable prices. Harris Seeds: Harris also offers row covers and portable greenhouse tunnels at good prices.